Google is already winning the browsing world with its Chrome browser, but that is clearly not enough for the search giant. The company now wants whoever is still left on Microsoft’s browsers. In a new campaign recently launched to target Microsoft Edge users, Google is proactively showing users steps to make Chrome the default browser choice replacing Microsoft Edge. 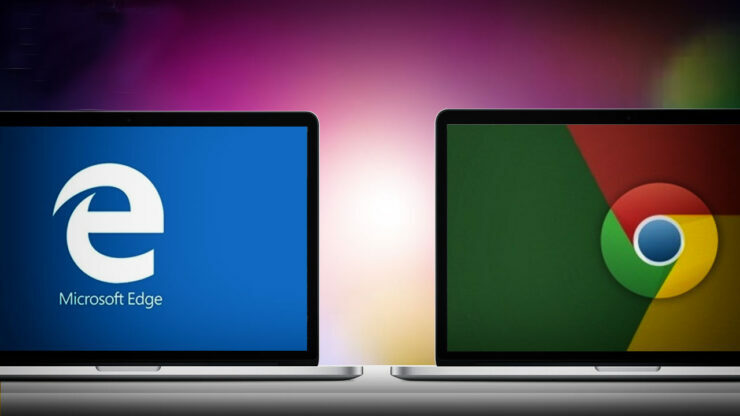 Microsoft has traditionally made it a little difficult for users to switch default browsers, potentially warranting this campaign. 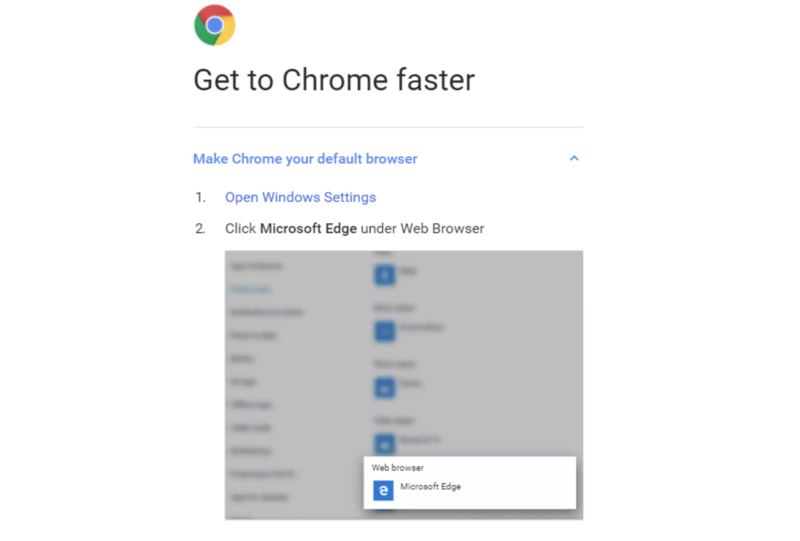 The new “Get to Chrome Faster” campaign launches a new tab that lists the steps users need to take to change the default web browser on Windows 10, linking you directly to settings. The steps also include instructions on pinning Chrome to the Windows taskbar for easier and faster access. While Microsoft has made it complicated to change the default browser on Windows 10, it also continues to tie in different features with its Edge browser to make more people use the deserted browser. The popular handoff-like feature that lets iPhone and Android users continue their work on PC is also largely limited to Microsoft’s Edge browser. For whatever it’s worth, Microsoft continues to bring its browser to different platforms. 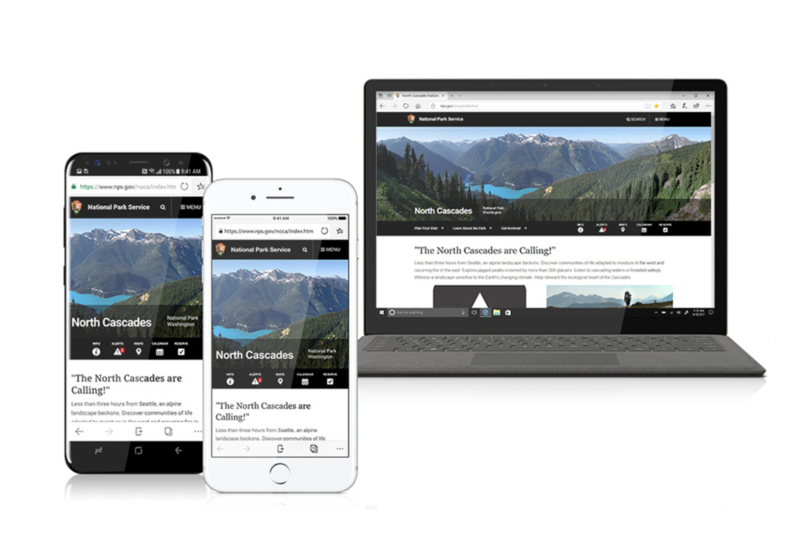 Microsoft Edge is now available to both iOS and Android. Again, the company is using similar strategy of luring customers in with features that enable them to resume browsing on their Windows PCs when they use Microsoft Edge on mobile to push web pages. The browser is available in both the Play Store and App Store and is in testing phase. Windows 10’s “Continue to PC” functionality remains at the center of this new push to mobile platforms that might finally help the company get some better numbers. The company boasts having over 330 million users on Microsoft Edge, but stats reveal that the browser has a total of over 5% of the market share. Compare that to Chrome’s nearly 60% market share and you get the picture. The new Google campaign has also drawn some criticism over Google trying to monopolise a market that it’s already currently leading. Interestingly, this new Google Chrome campaign hasn’t been spotted on other browsers on Windows 10, even though they have bigger market share. As Ghacks noted this could be because users have already made a choice to change their default browser to Firefox or Opera, but those on Edge have probably just let the default settings go unchanged. Unlike Microsoft’s incessant update notifications, however, Google isn’t spamming anyone allowing users to dismiss the instructions by clicking on the continue button. This exits the “Get to Chrome faster” tab and loads a new tab instead. It isn’t clear if everyone using Chrome on Windows 10 – but not as a default browser – is seeing this campaign or if the company is testing it on a smaller set of users.